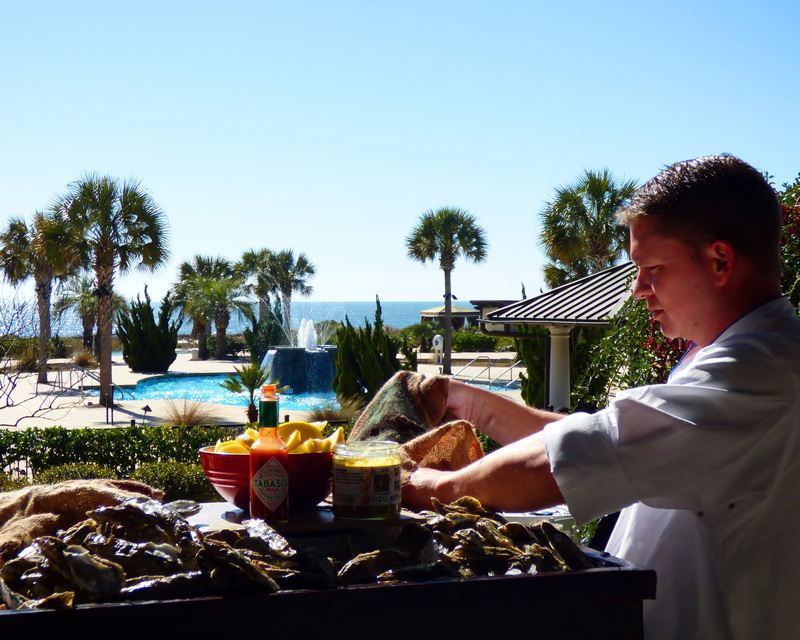 Chef Riley McGillis shucking local oysters for the ocean view raw bar. 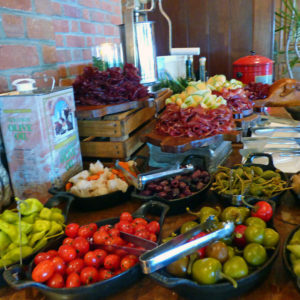 Have you been to the world class Brunch at Kiawah Resort, SC ? If not, make plans now to treat yourself. 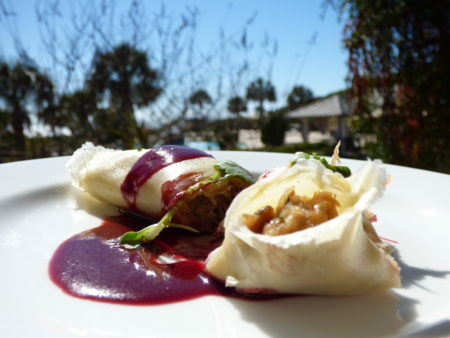 Brunch at the Jasmine Porch restaurant of Kiawah resort has been awarded “Best Brunch in South Carolina”. It is also my personal favorite spot around Charleston for an indulgent brunch outdoors. 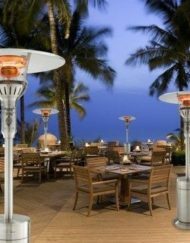 Ocean views and breezes provide a beautiful backdrop to the fresh, local, and creative menu. This brunch was the final event of the 6th annual Gourmet and Grapes Weekend. It is a charity fundraiser which brings together wine makers and chefs to benefit Hollings Cancer Center of MUSC . It is held annually at The Sanctuary Resort. But the Jasmine Porch offers a wonderful brunch in the same location with similar offerings every Sunday. Here are some photo highlights of our brunch last Sunday to further convince you. 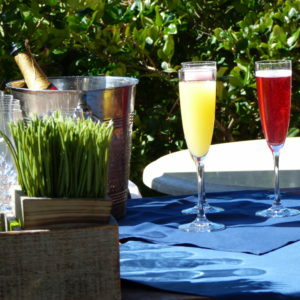 Alfresco Champagne Bar offered various colorful takes on a Bottomless Mimosa. 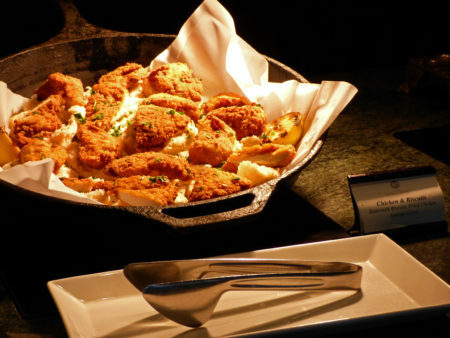 Classic southern comfort foods like fried chicken biscuits tempt guests. The culinary team at The Sanctuary always does a great job highlighting the abundance of Charleston’s seafood. 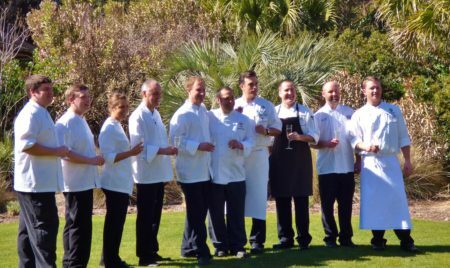 All the talented chefs of The Kiawah Island Resort work with local farmers and producers in an effort to provide the best certified organic local produce in various seasonal menus. 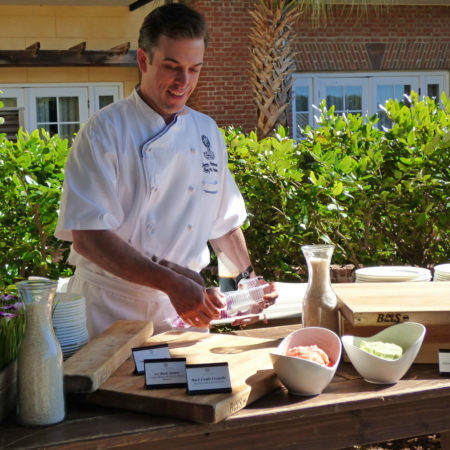 Jasmine Porch Chef Ryley McGillis has a strong menu focused around the rich food history of the lowcountry. Some of the brunch menu highlights on our visit included low country shrimp and grits, fried chicken on buttermilk biscuits, local kale salad, house-made chacuterie, and a lowcountry local raw bar. 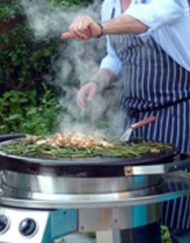 All displayed both the richness of the local resources as well as the talent of the kitchen. 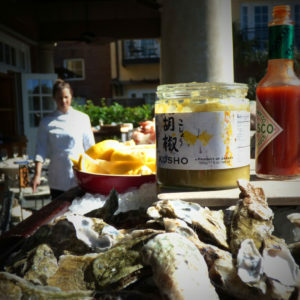 Local Caper Blade oysters, oyser shooters, and pickled shrimp were displayed on raw bar. 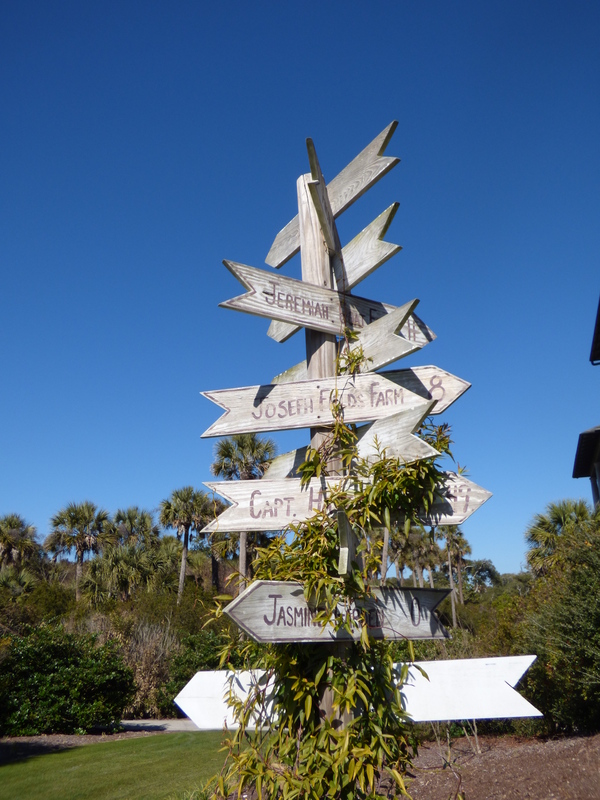 A sign post highlights the close available resources of Kiawah. 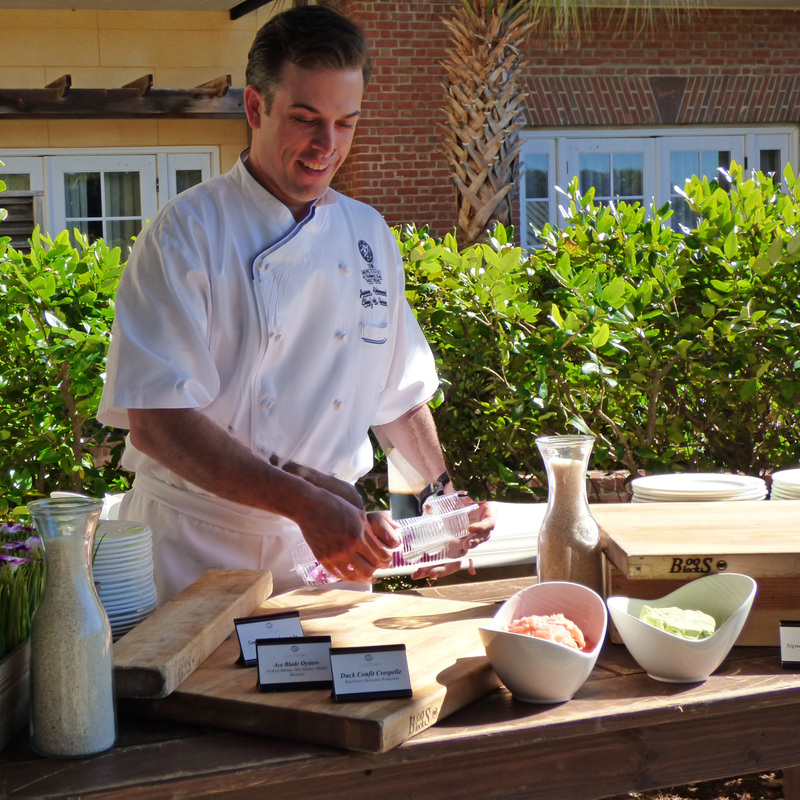 Because this was the farewell brunch for Gourmet and Grapes weekenders, all of Kiawah’s executive chefs were on hand interacting with guests. You won’t find a more engaging team of culinary professionals. They all seem to have both an authentic passion for their art and a fondness for their workmates. That’s a lot of talent employed at Kiawah Island Resort. 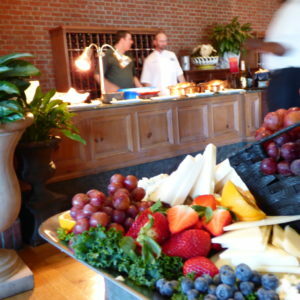 The Resort provides guest many dining options with 11 restaurants. Dining choices include prime beef, sushi, fresh seafood, authentic Italian, poolside burgers, and southern BBQ. 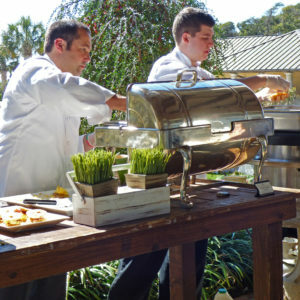 The talented team behind a lot of great food at the Kiawah Island Resort. Many Charleston locals I have spoken with don’t even realize that ALL of the dining options at Kiawah Resort are open to the public. And that is a real shame. 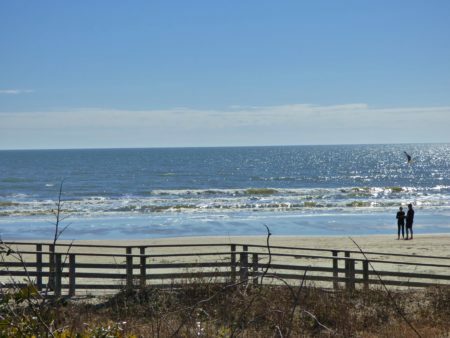 Because for me, a short ride out to Kiawah is completely transporting. For a couple of hours I’m on vacation. Don’t let that security gate deter you, just tell them where you’re dining and they will happily give you a pass and a small map to get you there. To help you select where your next dining “staycation” will be or to make reservations just click here- Kiawah Island Resort Dining. And for the record- Kiawah isn’t providing me with any moneteary incentive or freebies to tell you this! It is my own humble but good local advice. This is just one of my many favorite things about living in Charleston- enjoying world class vacation experiences at our doorstep. 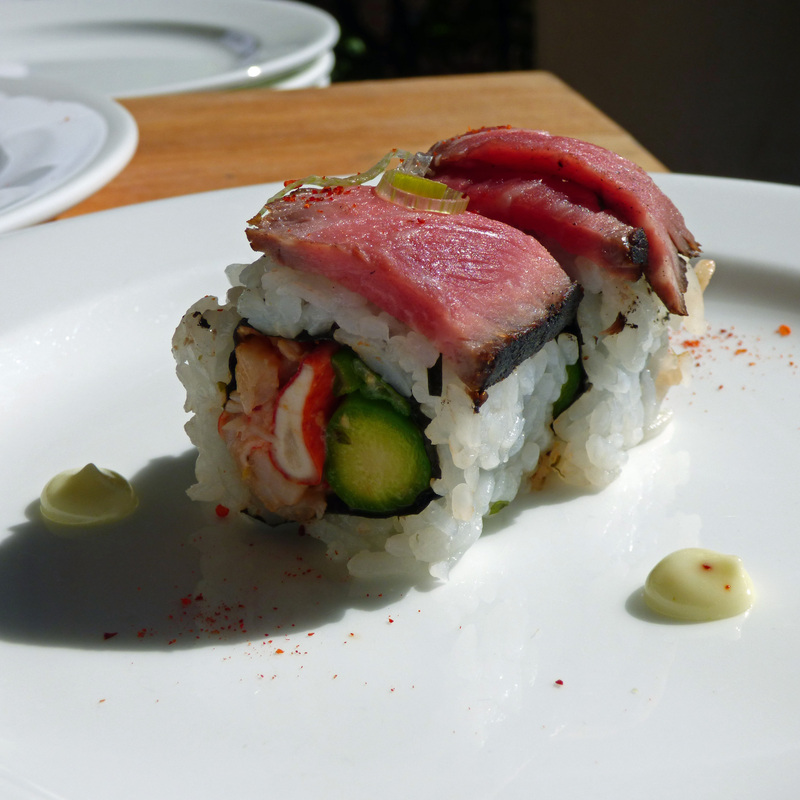 The Ocean Room Executive Chef, the always charming Jason Rheinwald, created a very popular Surf and Turf Sushi roll. It was impossible to have just one. Chef Jason Rheinwald of the Ocean room created a special surf and turf sushi roll. Maine Lobster, Asparagus, and Seared Prime Beef in a jewel like package from Chef Rheinwald. The Atlantic Room team headed by Chef Jonathan Banta choose to prepare a take on a “down home southern classic” on the stunning patio with the use of our table top Evo Grill. Sorghum Molasses was made into a gelée and melted inside the mini Johnny Cakes before flipping. The finished cakes were then used to make a sweet and savory sandwich of softly scrambled farm eggs, cheddar. and crisp applewood smoked bacon. Southern classic ingredients served up “a la minute” oceanside (The menu possibilities are truly limitless when you work with an Evo Grill ). 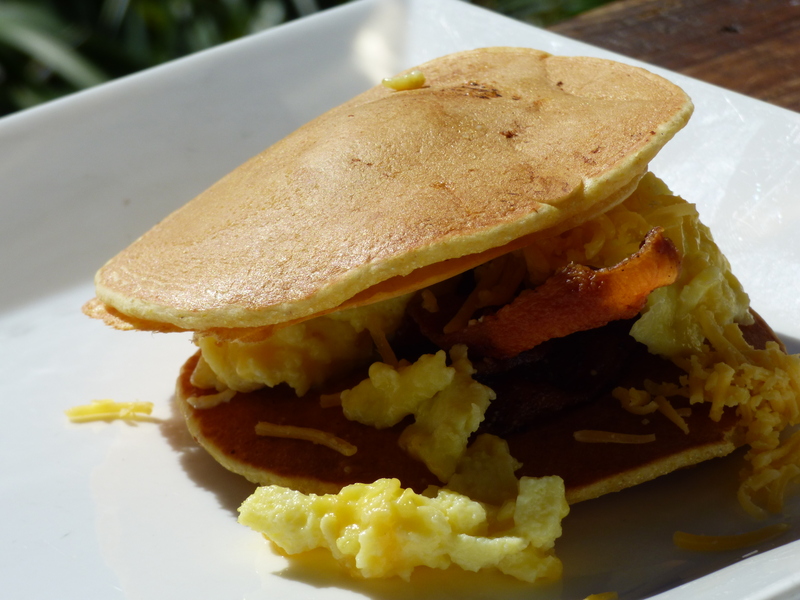 Johnny Cake sandwiches made with Sorghum Molasses Gelée , Scrambled eggs, and bacon. 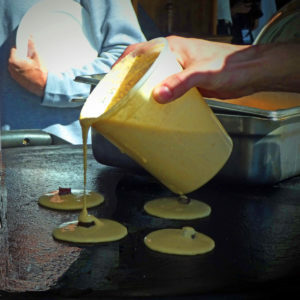 Chef Jonathan Banta of The Atlantic Room used an Evo Grill to make fresh Sorghum Molasses Pancakes. Enjoy pancakes from the evo grill. 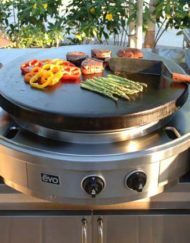 The table top evo grill makes alfresco cooking a breeze. An Italian take on breakfast crepes hits the perfect balance. Another dish which was a real highpoint for me was Chef Jonathan Williams’s Italian take on a breakfast crepe. Chef Williams heads the Italian kitchen over at Tommasso Point inside the Turtle Point Clubhouse. His Duck Confit Crespelle was a delicate dish of perfect balance. The freshly made crepe was filled with moist duck confit and then served with a delicious blackberry balsamic sauce and micro greens. It had that sweet, salty, savory thing which I just adore when done well in a dish. especially at brunch. I’ve already made plans for a trip over to Tomasso Point to check out what else Chef Williams has up his sleeve. 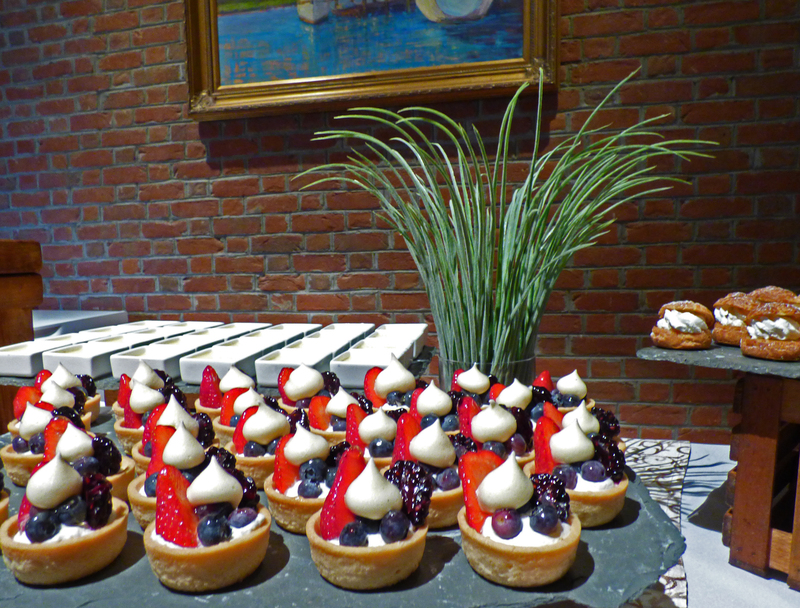 Desserts included fresh Fruit tarts, Crème Brulee’, and Earl Grey Macaroon. 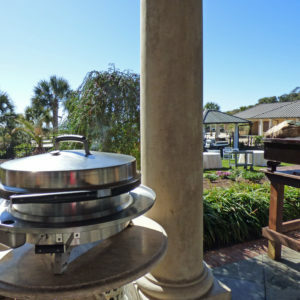 The February day I enjoyed brunch at Kiawah Resort, SC was 70 degrees under sunny blue skies. This meant a walk on the beach was in order to work off some of the indulgent fare. That also meant I went ahead and tried a couple Earl Grey Macaroons from pastry Chef Remy Funfrock. As good as what you would buy at a confectioners in Paris. Not your average buffet dessert fare at all. I wish I had saved room for more dessert dishes as both the crème brulee and chocolate cake looked worth every calorie. Next time. 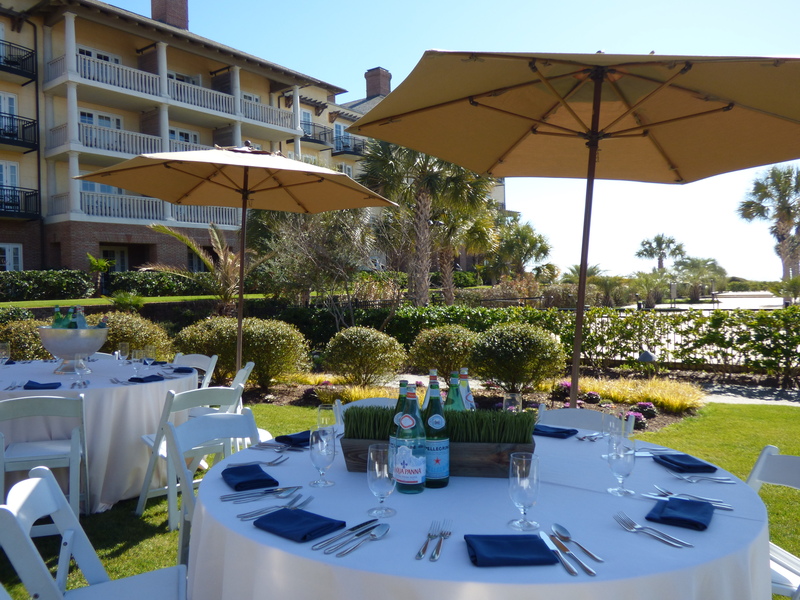 So, when are you going to brunch at Kiawah Resort? If you’re lucky enough to live in driving distance, I hope it’s soon. I’ll meet you by the macaroons. 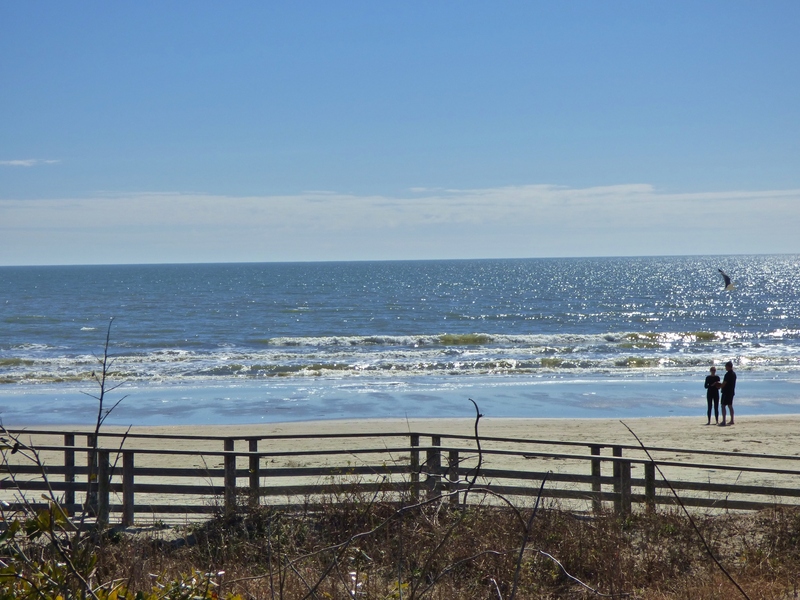 A long walk down Kiawah’s beach was in order after brunch. I agree. I remember going there and was very impressed. Glad to see the EVO Grill being used.